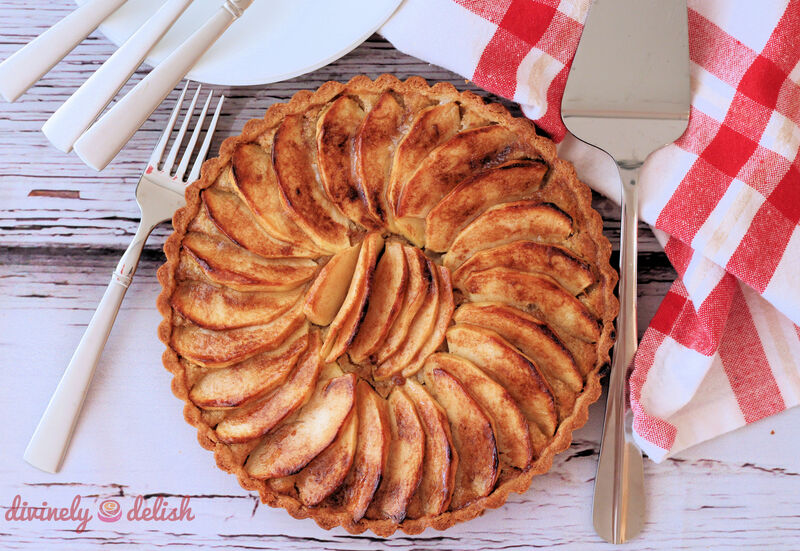 One of my favourite desserts to make for family and friends is Apple Frangipane Tart. 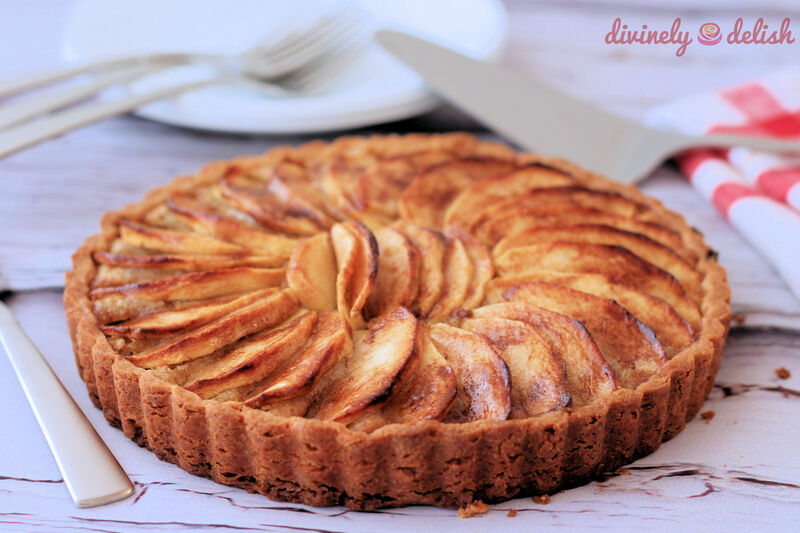 Made of a sweet shortcrust base (pâté sucrée), an almond filling (frangipane), and topped with apple slices and a sprinkling of cinnamon sugar, it’s homey and unfussy, yet so pretty and more elegant than apple pie. It’s delicious too, of course! 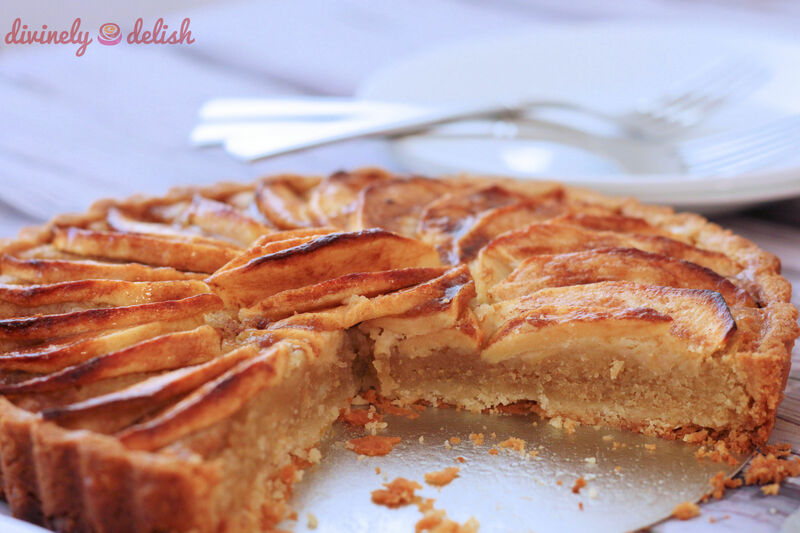 The acidity of the apples balances the richness of the crisp, sweet, buttery pastry and the dense, moist, nutty filling. Even though I used Gala apples, which are a sweeter variety, the overall sweetness was still pretty subtle. You can always change the flavour profile by using apples that are more tart, or a combination of sweet and tart…it’s totally up to you! It’s tasty on its own as a breakfast slice or afternoon snack, and an absolutely scrumptious dessert with chantilly cream (sweetened whipped cream) or vanilla ice cream. Let’s face it – being able to prepare in advance can save you a lot of headaches when you are hosting a big dinner party and doing all the cooking. Or, you are short on time and company’s coming. If you’re like me, and always insist on presenting something homemade, you can assemble and finish baking this beautiful, made-from-scratch dessert in less than a couple of hours! How amazing is that?! Oftentimes, I’ll make a double portion of pâté sucrée, and freeze half of it. And, since I love using frangipane as a base for all kinds of fruit tarts, I usually end up with leftovers that I freeze. 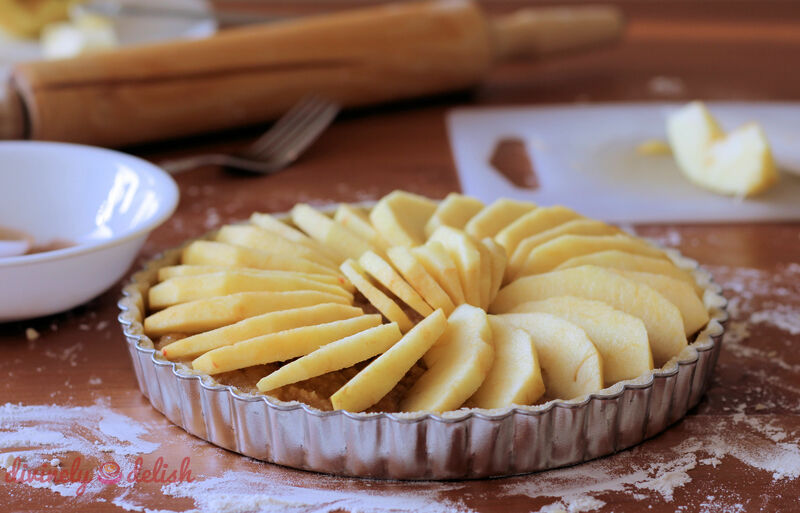 This means that sometimes, all I need to do is thaw the pastry and frangipane, roll out the dough, fill it, and arrange some sliced apples on top. It doesn’t get easier than that! Glazing is optional, although it does seal in the moisture of the apples and helps to keep the tart fresher for longer. It also gives a nice shine, just like those bakery tarts! 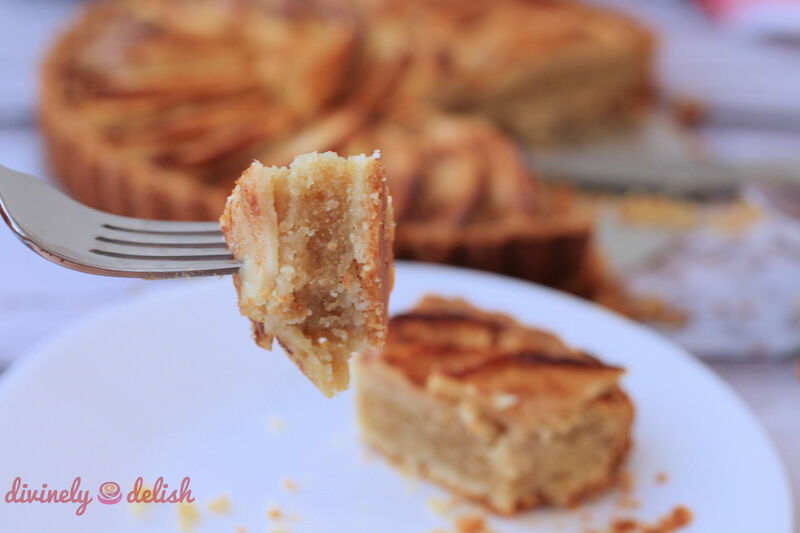 If you love frangipane, make sure to check out my Bakewell Tart too, which uses the same filling and sweet shortcrust pastry. *Use a food processor to blitz the lady fingers to fine crumbs. Do not substitute with bread crumbs. 1) Using a mixer fitted with a paddle attachment, mix the butter and sugar on slow speed until well blended and no lumps remain. Periodically scrape down the sides of the bowl. 2) Add in egg yolk, vanilla extract and lemon zest. Mix on low speed, scraping down the sides, until well blended. 3) Add in the flour. Continue to mix on low speed until just combined. Do not overwork. 4) Using your hands, bring the dough together to form a ball. 5) Shape dough into a flat, round disk. Wrap well with plastic wrap and chill for at least 2 hours. 1) In a mixing bowl, cream butter and icing sugar on medium speed. Add in vanilla and lemon zest and continue mixing until light and fluffy. 2) Add eggs, one by one, mixing well after each addition. 3) Add in ground almonds and sponge crumbs. Blend well. Set aside. 1) Preheat oven to 350F (175C). Place a baking sheet inside the oven while it preheats. 2) On a lightly floured surface, roll out the dough to about 1/4″ thickness. 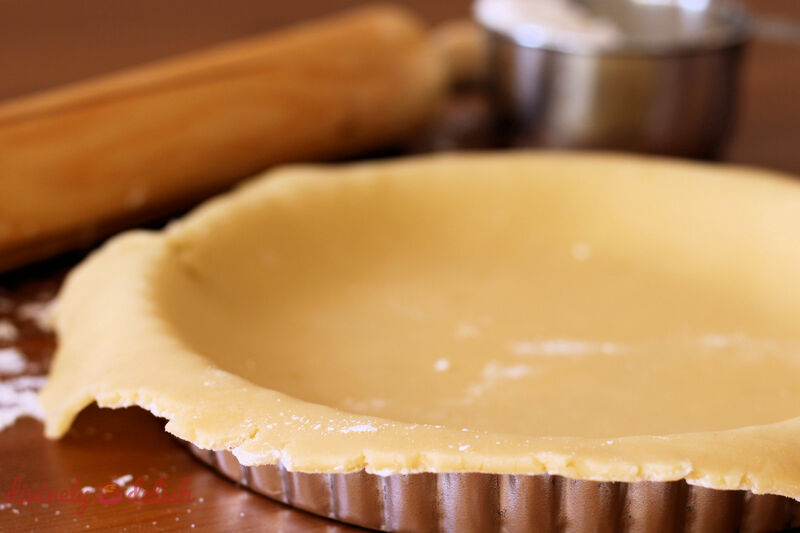 To transfer, roll the dough carefully back onto the rolling pin, then gently unroll it over an 8″ or 9″ tart tin. Shape the dough by pressing it into the tart tin. Use a knife to trim the excess dough. Dock the pastry by pricking all over the base with a fork, then chill for 30 minutes. 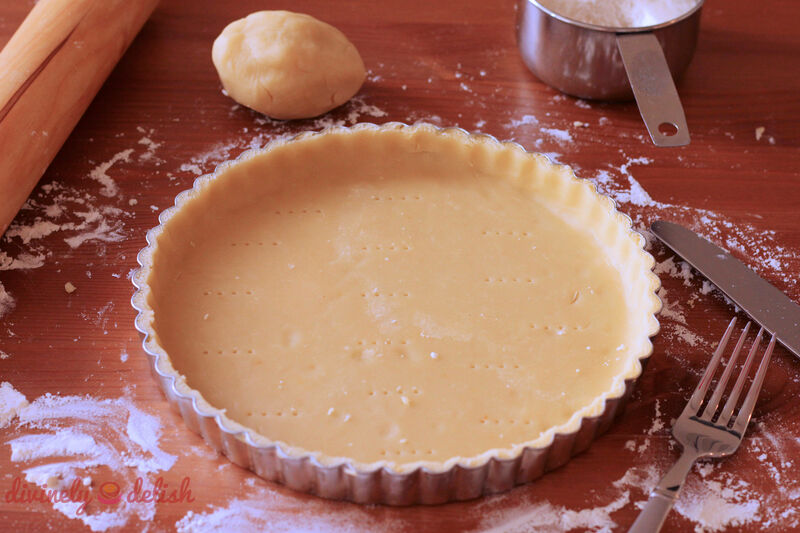 3) Fill pastry in tart tin about half full with frangipane. Level the surface with the back of a spoon or palette knife. 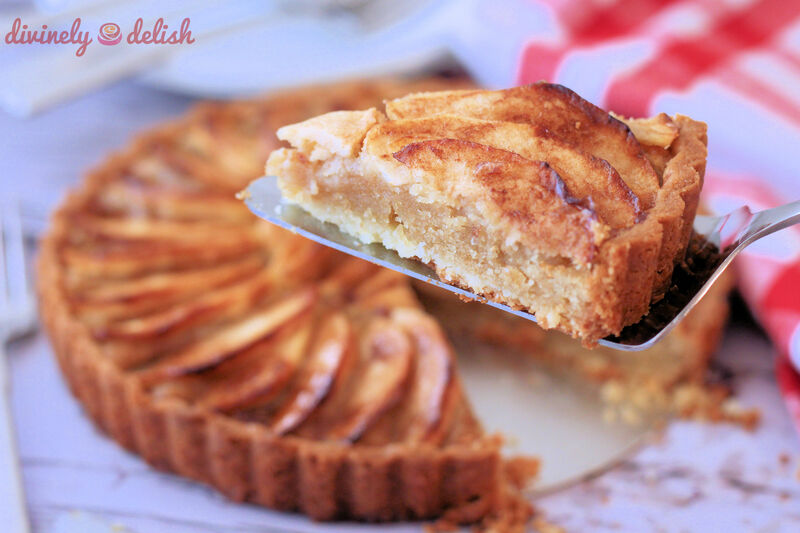 4) Starting from the outer edge, place the apple slices all around, pressing lightly into the frangipane mixture. 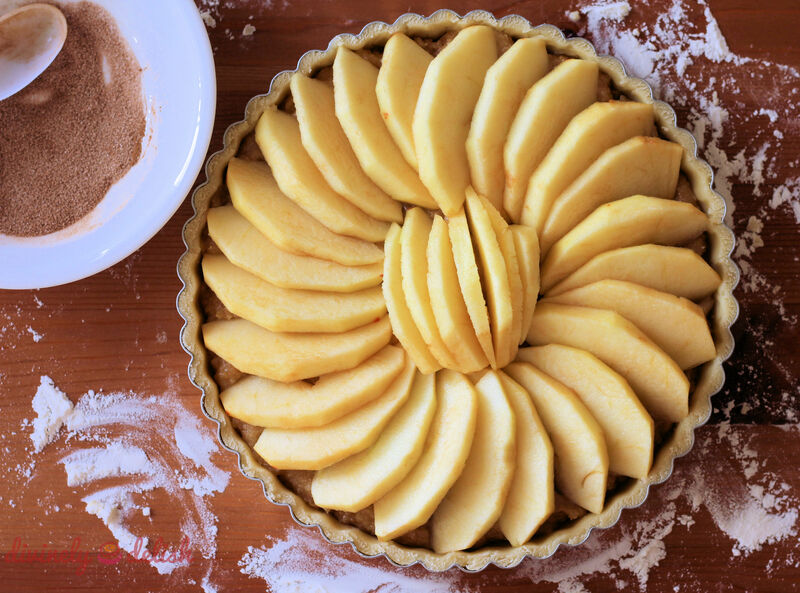 Make sure that they are slightly overlapping (more so towards the centre of the tart, so that you create a fan shape). Continue to arrange the slices until the frangipane is completely covered. 5) Mix together the 2 tablespoons of sugar and 1/2 teaspoon of cinnamon and sprinkle evenly all over the tops of the apples, then dot the surface with 1 tablespoon of butter. 6) Place tart on the heated baking sheet in the oven. 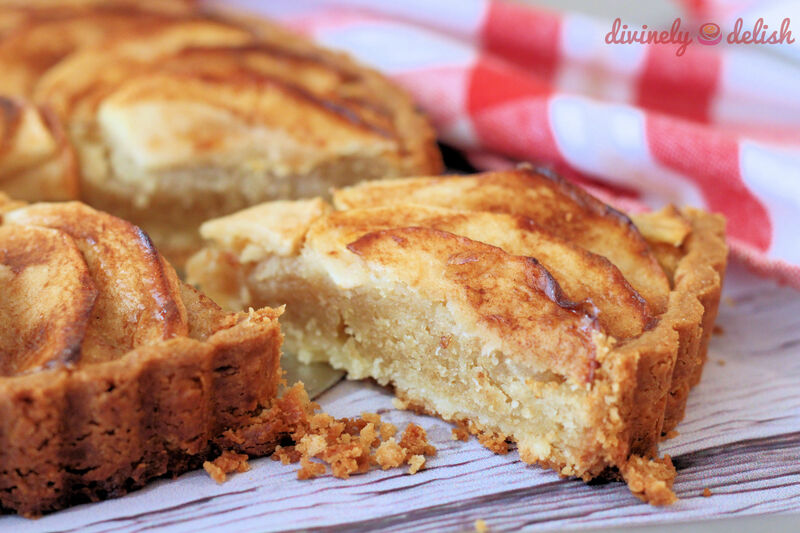 Bake for 45-50 minutes, until the crust is golden brown and the apples are tender/filling is firm. Cool on a wire rack. 7) (Optional) Heat the apricot jam in a small saucepan over low heat, just until it becomes liquid. Then pour through a sieve placed over a small bowl. Using the back of a spoon, push through any remaining liquid (discard the leftover fruit pieces). Use a pastry brush to brush a thin layer of jam over the apples. Best served at room temperature or slightly warm, with chantilly cream or a scoop of vanilla ice cream. Thank you! And thanks for the follow! Avocado cake sounds yummy! !